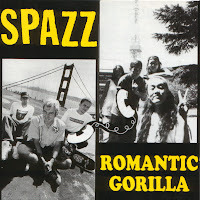 In 1994, we recorded a split LP with Romantic Gorilla from Japan. Best band name ever. 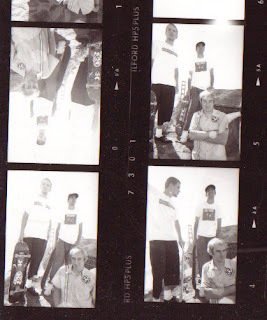 And we were lucky enough to play with them a few times as well... the first show was at Gilman, and strangely enough, the second show was 5 days later in Tokyo. The split album was released on Sound Pollution in 1995, and it's long out of print. Our front cover photo was taken by Winni Wintermeyer. Someone came up with the idea that we each take a band pic in front of a landmark from where we live, so Spazz is in front of the Golden Gate Bridge, and Romantic Gorilla is in front of the Tokyo Tower. That weird white thing in the middle is supposed to be a telephone linking us to each other. Awww... isn't that adorable? This link is for the Spazz tracks only. Check out what we were up to in '94. I am a huge Romantic Gorilla fan and was wondering if you had any items of theirs. I would gladly purchase them from you if you would be willing to part. Was the yellow ink on the jacket and black wax the first pressing? Thanks. My mate Chris just gave med the cd, it rocks!! I would love to hear this! The links broken so if you get a chance, I'll grab it from this site and put it up on an open punk torrent site (private but membership is open) where links don't die.